In the South Jersey region, Quakers sponsored the earliest schools. Thomas Budd, a Quaker leader and intellectual, recorded the Quaker response to education in 1685 in the book Good Order Established in Pennsylvania and New Jersey in America: Being a True Account of the Country. In it Budd suggests that New Jersey legally require parents to enroll their children in school for at least seven years; that municipalities provide schools and teachers; and that boys and girls be instructed in reading, writing, arithmetic, English, Latin, and bookkeeping, in addition to boys learning a trade and girls learning spinning, weaving, knitting, sewing, and needlework. From 1746-87, Quakers made further efforts to ensure their children's education, recorded in the Rules of Discipline of the Yearly Meeting of Friends for Pennsylvania, Maryland, Delaware, and the Eastern Parts of Maryland. One means was to entice knowledgeable teachers by offering them land for an ample homesteadas well as a salary. They also proposed that a collection taken at monthly meetings augment the teacher's salary or lessen the burden of tuition on poor families. Free, tax-supported public education was not instituted until the 1870s. A committee was also appointed to maintain the schools, gather funds, and review tutoring and teaching applicants. The Old Stone School House, erected by Quakers in 1810 outside Greenwich in Cumberland County, is one of the oldest extant schools in the region (Fig. 99). 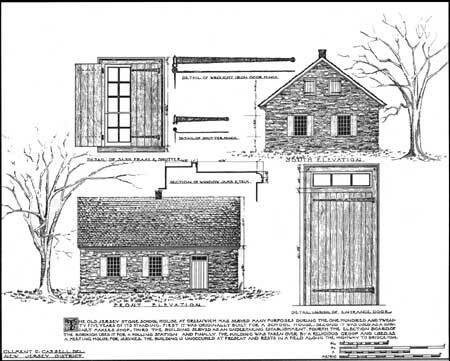 Like a number of other early, vernacular stone schools in New Jersey, its simple rectangular form and scale, with hand-wrought details, is typical of a folk form associated with pre-homogenous cultural settlements. Figure 99. Old Stone School House, (1810, HABS No. NJ-222). One-and-one-half story sandstone walls are ca. 18" thick; shutters and doors are cedar with hand-forged hardware. HABS. Prior to 1817, the few public schools were supported solely by their respective communities. That year, however, the New Jersey Legislature first recognized the need for public education and provided for a state school fund. The Legislature invested $15,000 for a permanent public education fund; two years later this had increased to $113,238. By 1824, one-tenth of the state taxes were conferred to it annually, and townships were authorized to levy taxes to provide education for the poor, as well as to build and repair schools. Despite recognition that education was a public and governmental responsibility, private schools continued to outnumber public institutions. One of the first private academies in the South Jersey area was Union Academy in Shiloh, founded in 1848-49 by Professor E.P. Larkin. The Seventh Day Baptists financed construction of its two-story, brick building that cost $10,000: The first floor housed recitation rooms and laboratories, the second a large hall. It remained a private institution until purchased by the public school district in the late nineteenth century. Today it serves as the south wing of the Shiloh Elementary School; a 1920s addition, similar in scale, constitutes the north wing and building front. Though individually distinct and simply connected along one facade, this structure exemplifies the ongoing preference in form, scale, materials, and styling that prevailed in urban school construction through the mid twentieth century. Throughout the end of the nineteenth century, the Legislature worked to improve the school systems. Between 1874-94, the number of school districts fell from 1,500 to 400. Five assistant commissioner posts were created with a county school superintendent, director of teacher training, normal school principals, and instructors. In the 1870s a new compulsory education law required that all children age 7 to 16 had to attend a day school or receive classes elsewhere. Children 14 to 16 with employment certificates were excepted. The children of migrant-worker families escaped the notice of truant officers; even though they, too, were required to attend school according to the law, few were made to do so. Figure 100. Vine Street School (1906). 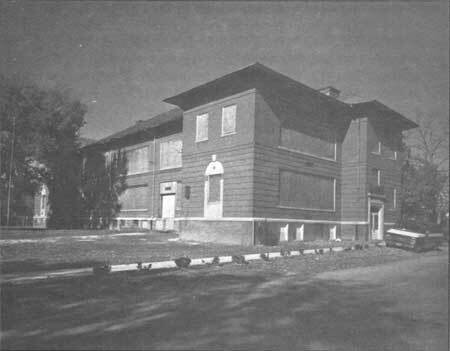 The two-story, H-plan building has a formal three-part brick facade with hipped roof and raised basement. Figure 101. 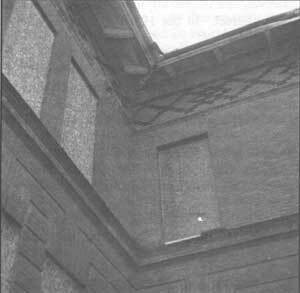 Detail, Vine Street School, snowing wide eaves with beltcourse, and rusticated walls. Sebold. South Jersey's extant nineteenth- and early twentieth-century urban schools share certain structural and stylistic forms. In areas where the population and economy flourished, large, comfortable, and more permanent structures predominate. Expensive and well-crafted materials such as stone and brick are employed in designs that adhere to formal principles of proportion, scale, and ornamentwith Classical Revival and Italian Renaissance Revival being two popular styles. Two examples of these fine nineteenth- and twentieth-century schools are Bridgeton's Vine Street School and Millville's Memorial School. Vine Street is constructed in an Italian Renaissance palazzo style, with large chimneys and fancy brickwork. The Millville Memorial School, an elegant, one-story, Italian Renaissance-style structure with arcade-like openings along the front facade, was built to commemorate local citizens who died in World War I. The entrance features their names and the names of others who gave their lives in subsequent wars inscribed in a placque. Originally built as a high school, it now serves middle-school students. Today most of these facilitiesif still in useserve as elementary schools. New area high schools were built in the 1960s and are large enough not only to accommodate students from the respective towns, but also the school-age residents of the surrounding townships. As a result, use of rural schools has declined since the mid twentieth century. Historically, as well as today, it is common for children to attend elementary and middle schools in their township, and then travel to high schools in Salem, Bridgeton, or Millville. Despite having fallen into disuse, however, examples of the rural township schools are extant and in good condition.